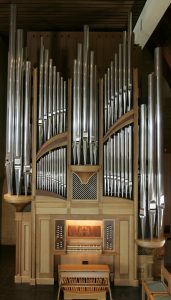 The dream for the St. Stephen’s pipe organ started with a gift of $289,000 in 1992 from the estate of Ed Thomas, who was a charter member of St. Stephen’s. Once the estate was settled, a Pipe Organ Committee was formed in September 1996 and it was given the task of selecting a builder. Committee members Dave Dohler (chair), Gene Copenhaver (executor of the Thomas estate), Pastor Bruce Burnside, Dennis Douglas (organist), Sylvia Reinholdt, Mary Tygum, Jeffrey Cox (music director), and Candace Johnson selected Dr. John Chappell Stowe, Professor of Organ at the UW-Madison School of Music to be the consultant for the project. Under Dr. Stowe’s direction, the Committee learned about pipe organs, researched the acoustics of the church’s sanctuary, visited, played and listened to pipe organs around the country, and considered six potential builders. The Committee recommended Manuel Rosales be selected as the builder, and contracts were signed with Rosales and Parsons on December 21, 2001. Manuel Rosales, a native of Los Angeles, designed the organ. He is a member of the International Society of Organ Builders and The American Institute of Organ Builders, and is a founding member of the Pacific Southwest Chapter of the Organ Historical Society. Among Mr. Rosales’ many acclaimed works, the best known is the now famous Glatter-Götz/Rosales Concert Organ in the Walt Disney Concert Hall in Los Angeles. In addition he has built or restored organs at 20 churches in the past 25 years, including ones at Emory University and Rice University. The organ is a freestanding, two manual and pedal, mechanical action (tracker) instrument. Charles Clancy, of Walnut Grove, CA, completed the design of the casework and façade following the initial concept of an organ by Didier Grassin. Pipe scaling and wind chest pipe placements were a collaboration with Manuel Rosales and Kevin Gilchrist, a Rosales associate. Shop drawings using three-dimensional computer graphics were completed in Parson’s design department. It required approximately 13,000 hours to design, build, and install. The 30 rank organ has 1755 pipes, stands 25 feet tall and weighs approximately 21,000 lbs. The interior metal pipes were made by the Fitzau Company in Portugal and are of various compositions of hammered lead, scraped tin, spotted metal and copper. The façade pipes are 70% polished tin, fabricated by the Laukhuff Company in Germany. The wood pipes, crafted in Parson’s workshop, are made from poplar and Douglas fir. The organ’s mechanical key action is referred to as suspended action; that is, the keys are suspended from the chest pallets with trackers that connect the key to the windchests. There are 29 speaking stops. A combination-preset system is possible through the use of electrically operated drawknobs and slider motors. This allows the organist to accommodate quick registration changes that are so much a part of service playing. There are 200 levels of memory available. The wind system in this organ uses a 3/4 hp blower and a single wedge bellows to monitor the pressure and volume of air to the pipes. The casework is entirely quartersawn white oak with an oiled finish. The accent woods used throughout the organ are wenge and black walnut including the bookmatched, burled veneers used in the stop jambs and music desk. The interior construction of the organ is made entirely of poplar. To hear the organ in a performance from the 10th Anniversary Concert, click here. Interested in scheduling an organ visit/tour, rehearsal, or performance? Please fill out the form below, and our music director or organist will contact you to help you schedule your event or trip.